Saw these folks on my walk today. They were standing at the edge of the pond. 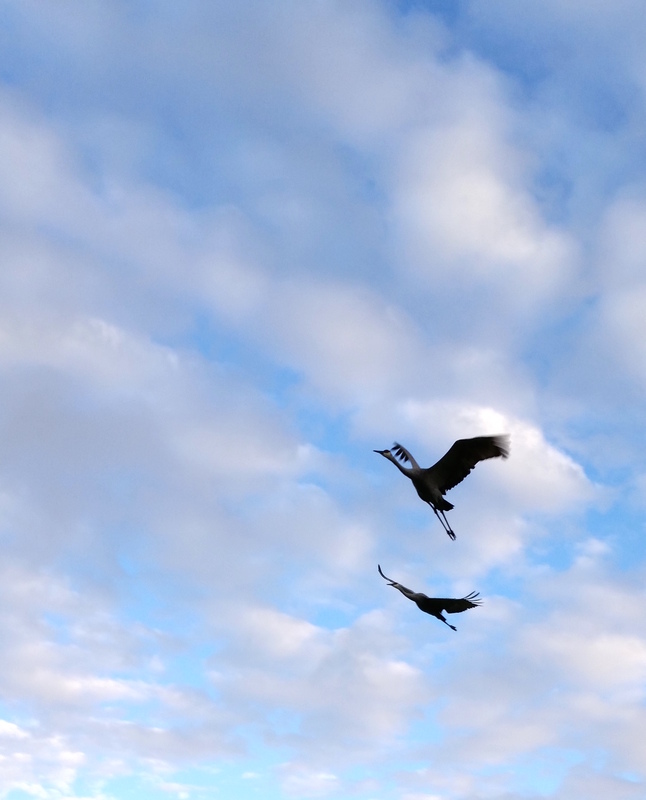 At first, I thought they were the great blue herons we’ve seen on and off the past few weeks (of whom I have no photos because I’ve gotten lazy about bringing my camera on walks ever since Lilo ate the wrist strap). This is the first year I’ve seen great blue herons hang around in a pair, although admittedly these don’t stick by each other much. I saw them fly together for a couple hundred yards and then stand on a dock for about a minute before one of them flew off to a different area. As I got closer—maybe about a hundred yards away—they looked less like herons to me. If I were an expert, I’m sure I could tell you why, but as I’m not, all I can say is that their shape seemed more cranelike than heronlike. When I got close enough to see the red around their eyes, I knew for certain they were sandhill cranes. I was still about fifty yards out, but they didn’t like that. Or maybe they were feeling crowded by all the geese hanging around them. They came barreling toward me and launched into flight. Luckily, I had my phone out. The photos it took won’t win me any Pulitzers, but I think they’re pretty nice, all things considered. In the top photo, they’re almost right above my head. But his one from a second or two earlier is also pretty nice, and captures an interesting angle as they rise up toward the sky. They made that awesome dinosaur call as they flew over me. It sounds a bit like a creaky hinge crossed with someone draggind their hand over the surface of a rubber balloon, but translated an octave or two down. 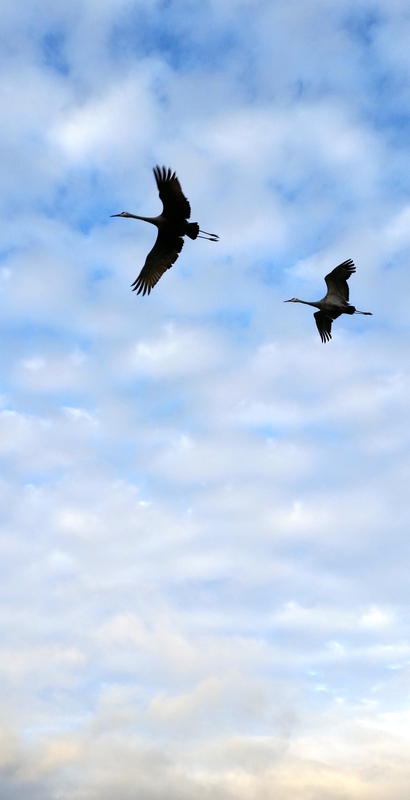 You can listen to crane calls on the Cornell Ornithology website. Well, it's pretty embarrassing I didn't see this comment until today, more than half a year later! Oh, and raisins or other dried fruit work just as well in the granola bar recipe. I just have a fondness for the sweet-tangy taste of prunes. Have you gotten to experiment with the recipe yet? Or machine darning?